Welcome to the very first episode of The State of You – I am Bindi – thank you for joining me on this journey where I hope to bring you valuable insights, inspirational stories of transformation, wellness, motivation and triumph. I hope you will gain some useful tips, tricks and tools throughout our journey on living your best life. I will have a plethora of guests joining me in future episodes to share their stories in The State of You. First just let me say, I am not a Doctor or a medical professional, I am not a psychologist, nutritionist or a personal trainer. I am human, I have experienced so much in life in 43 years, achieved so much in my career and personal life, reached many goals, inspired others and most of all I have learnt so much from my experience about what it takes to make change happen. Let’s say I have a PHD in experiential change! But what makes me so different? Well a lot of things really – I am unique, but let me tell you a few stories to help fill the gaps for you. When I left school in 1992, I had no idea what I was going to do with myself – all I knew was at the time university was not an option for me due to finances – also it was never a big aspiration of mine to attend uni. I always had the idea that there was no greater teacher than the world around us. So I started out in the small country town of Aratula in Queensland, doing part time jobs on farms and local stores while I worked out what the heck I was going to do. I can remember working on a farm where I was processing carrots for packing and I remember standing at the conveyor belt day after day dreaming of travelling overseas – particularly to America. At some point in 1994 a penny dropped and I decided I wanted to try out the travel industry and enrolled myself in a diploma of travel and tourism course by correspondence. To my surprise, I aced it with flying colours, then the hard part came – trying to find a job with no experience, but with the qualifications. I sat at a hard wooden desk my Grandfather had made day after day hand writing job applications and kept a tally and status of how they were all going until I reached 100. This was before we had a computer – bear this in mind – all hand written! As time went on my frustration grew – I was putting myself out there day after day and nobody wanted to take a chance on me. It became a pretty dark time for me back then and if I didn’t make change soon, the spiral would deepen. Training organisations back then were just starting regulation and I did get fleeced by at least one. I started to think ok – time to diversify – maybe try something else – I saw a course in the paper for a Pharmacy Assistant’s Course – sounded like fun – sign me up! This wasn’t your regular kind of course – it taught all the aspects of working in a pharmacy including makeup, manicures, personal development – the whole 9 yards. I developed a rapport with the Director of the training company and we became good friends – she could see that I needed help and that I had the drive. She shared many personal development books with me over time, which I absorbed like a sponge – I discovered the greats like Tony Robbins, the late Dr Wayne Dyer – who we had the pleasure of meeting – I still remember the big warm hug he gave me, there was also Louise Hay, Marianne Williamson and many more. I soon learnt that change requires action and so Awaken the Giant Within became my life’s bible, which I followed to the letter. My life transformed from night to day – I lost 25kg, I quit the alcohol that was holding me back – I was fit, healthy, happy, I got the job I wanted, a car and ultimate independence – ah life was grand! Janet was belting out ‘What have you done for me lately” and I was jogging to the beat – in the zone – and then it happened – the nauseating feeling I still get thinking about it is like it was on that day. My right foot didn’t quite land the bounce properly, rolled on the outer side and SNAP! – oh lord what did I do? It’s ok walk it off kiddo – you’ll be right – then the swelling and all kinds of purple kicked in – nah it’s just a sprain – it’s all good – the pain wow – ok let’s get some ice on this and elevate it and you will be just fine. Mum got home from work and saw the damage I did and I am not sure I can repeat what she said but she knew it wasn’t good. We both were just thinking it was a sprain and it would be fine – I had done this before. I went to work as a Travel Consultant in an agency, tried to drive my manual car, pushing through the pain until a week later, sitting at my desk, my foot started to go numb and I thought it was time I should probably seek medical attention. Sure enough x-rays showed I had fractured my ankle, and chipped the tip off my fibula and on my Mum’s birthday I ended up in plaster and fibreglass from toe to knee. Neither of us were impressed. The long sought independence I gained quickly vanished as it meant I could no longer drive, the exercise I was used to was gone and I was really dirty with myself for putting not only myself through this but also others. It was hard to reset and get back to where I was, no matter how hard I tried. My career started to take off and my own health and wellness took a back seat, the travel party lifestyle had me hooked and before long the good I did was gone. Then relationships started to cloud the water and life became an outright mess for me. I experienced some very abusive, controlling and opportunistic relationships – one of the worst landed me in bankruptcy and eviction – where I had no other choice but to turn to my family for help. Just before this, my Grandmother who I loved so dearly – passed away and I felt the world slipped out from under me. At the time I was in a relationship with a man who was dishonest, abusive, unfaithful and had caused me so much pain – it culminated into a standoff where he threatened to use his martial arts skills on my face and I decided I liked my face better. It was probably the lowest point of my life that I can remember – I decided it was time to lock myself away for a while and spend some time on me and find out who I really was. I lived in my Grandmother’s home in Aratula for a while – commuting to the city. I spent time on my small business, trying to pick myself up again, getting over the hurdles and letting go of all the destruction. It was during this time when I focused on me and wasn’t indulging in partying and chasing guys that I came to the very clear realisation I was gay. Everything started to make sense – it was like the penny had finally dropped. I had finally found where I belonged in at least one sense. From there things started to gradually improve all round, I continued to be unsuccessful in relationships, despite how great some of them were – I still managed to stumble across the damaged goods as some people put it and tried to fix them – was still used and abused and I came to realise it was me – I needed to have greater self respect for me and stop putting myself last for others happiness otherwise this cycle would continue and it did for many years. There was also the challenges of being gay I had to face that I still struggle with at times. In the last year I have realised the greatest relationship I have is the one I have with me – I always listen, I am always there and I always care. I try hard not to hurt you but sometimes I fail and I am sorry, I know your faults and weaknesses like no other, I know your secrets and you can’t hide them from me. Above all I know you mean well and you are doing your best and you are on the right path – where you are meant to be. Through the challenges of heartbreak, pain, bankruptcy, redundancy, abuse, injury – the moral of the story is it’s ok to fall, because without the fall you won’t understand the growth in getting back up. Just never give up – as much as you want to give up with every fibre of your being, please know there is a way in every challenge you face. Focus on the pleasure of reaching that goal and knowing there is no other option as enough to drive you away from the pain you experience. As we evolve, our focus may change – either positively or negatively, but just like that mini-tramp – there is no up if there is no down and often we have to get down to get back up again. If you’re listening to this right now and you are having a rough time, please know it’s ok to not be ok and there are people out there who can help you no matter what you are going through. 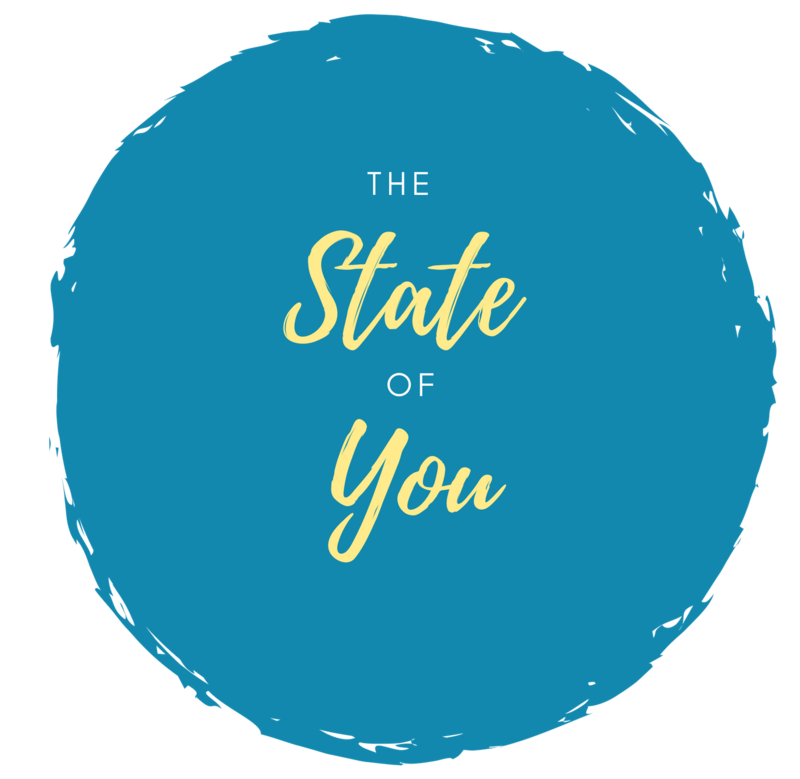 I appreciate you taking the time to listen to my story as episode one of The State of You – if you would like to share your story, please visit my website at www.thestateofyoupodcast.com and send me an email. If you need support, visit the links page on my site. If you enjoyed episode one please share your feedback – you can find me on Instagram @thestateofyou or subscribe to the podcast through my website. Next Episode 2 – Where do we start?